In today’s digital marketplace, maintaining a robust digital presence is becoming a requirement for success. Your business can offer the best services, but none of that matters if potential clients can’t find you online, but that’s where we come in. We are an expert team of marketers and SEO masters who make sure that people find what they’re looking for online, you. Our services put our clients at the top of their desired search results, and we help make sure that when people find them, they have a clear and concise brand image and story. As you may remember, 2018 marked a milestone for us, we were named a global leader among B2B service providers by ratings and reviews platform Clutch. And we are pleased to share that just as we ended 2018 on a high note, we are starting 2019 on another one! We have maintained our status as a top advertising and marketing agency, and we have also been listed as one of the top PPC management services in the UK. 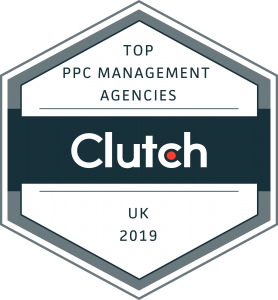 In an effort to help firms find the best fit in service providers, Clutch evaluated more than 700 PPC service providers all over the UK. After considering factors such as marketing presence, social media efforts, and client reviews, Clutch ranked Soap Media 9th overall. We strive to establish ourselves as more than service providers, but partners. Our client reviews help us gauge our success with our clients, and we look forward to seeing what else our clients have to say about us. In addition to our high ranking on Clutch, we have been featured on their sister-site, The Manifest. The Manifest is a business resource that offers how-to guides, industry reports, and expert opinions. After being the subject of their research, we were ranked fourth overall out of the top SEO Companies in the UK. It is an honour to be considered an industry leader as a result of our work, and to be held in high regards among some of the top design agencies in the UK. We would be remiss if we did not thank everyone who helped us reach this point. From the bottom of our hearts, there is no one we would rather do this for, and we cannot wait to keep working with you. Here is to the rest of 2019!